Abstract: To complement the High Definition decoding of the G45 Express, the P5Q-EM offers up HDMI, DVI and VGA video outputs, allowing you to output HD video right to a home theatre display without any additional expense. Asus' P5Q-EM motherboard combines an extensive feature set matched up with Intel's popular integrated graphics G45 Express chipset. The spec sheet for the P5Q-EM certainly reads like an enthusiast motherboard, but with the added benefit an Intel GMA X4500HD graphics processor at its core. In addition to its basic screen display capabilities, the GMA X4500HD graphics component promises support for high definition video playback, and full 1080p Blu-ray decoding without any hitches or slowdowns. To complement the High Definition decoding of the G45 Express, the P5Q-EM offers up HDMI, DVI and VGA video outputs, allowing you to output HD video right to a home theatre display without any additional expense. The board features an optical S/PDIF output in addition to the 8-channel audio for audio junkies with suitably equipped stereo receivers. The Asus P5Q-EM still leaves a fair amount of room for expansion; there's a PCI Express x16 slot for discrete videocards (a must if 3D gaming is in your plans), a pair of PCI x1 slots, and a standard PCI slot. Storage expansion comes care of the Intel ICH10R southbridge, which adds six SATA II ports capable of RAID 0, 1 5 and 10. A Marvell controller is used to control a single IDE port that supports two devices. 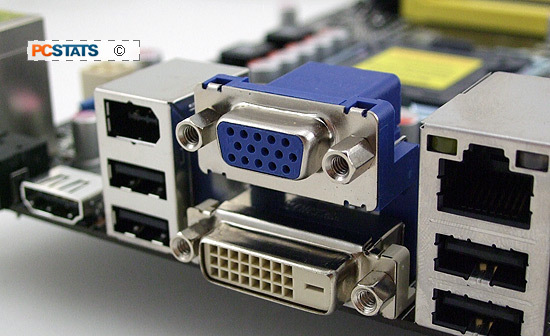 To round out the package, the P5Q-EM offers up gigabit networking and Firewire, with a 1394a socket on the I/O panel of the motherboard as well as header available mid-board. External-SATA is supplied in the form of an expansion bracket. The Asus P5Q-EM motherboard supports all socket 775 Intel processors, including the recent 45nm variants, running on a 800/1066/1333/1600MHz front side bus. The four DDR2 memory slots support a maximum of 4GB 667/800/1066 DDR2 RAM in 32-bit versions of Windows, up to 16GB in 64-bit Windows. The P5Q-EM also includes software and motherboard support for Express Gate, a fast-loading, miniature operating system that's accessible as a prompt option after the system is booted. Asus EPU power saving technology is represented, and as usual is awkward to use. PCSTATS power draw tests and blu-ray playback tests will get to the heart of the P5Q-EM. Asus is asking around $180 CDN ($150 USD, 99 £GBP) for the P5Q-EM motherboard - let's see whether this motherboard really justifies that sticker price with its array of features and extras. 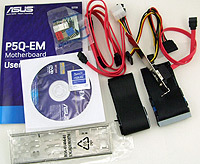 User Manual, Drivers, Q-connector, (4) SATA cables, (2) SATA power cables, e-sata bracket, IDE/floppy cable, I/O Shield. 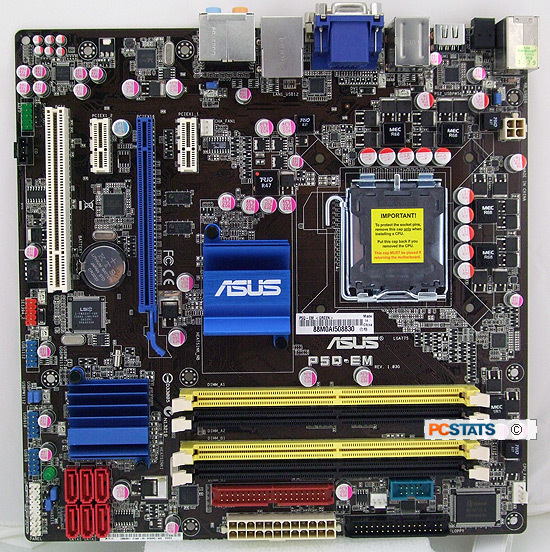 For starters, the Asus P5Q-EM motherboard manages to pack in a lot of features into a very small space, but its layout doesn't suffer overmuch from crowding. Indeed, when compared to ATX motherboards that also utilize integrated graphics processors, the P5Q-EM has a good layout that's easy to work with in the confined spaces of a home-theatre chassis. Some of this spatial consideration is helped through Asus' use of Q-connectors. These little plastic blocks are used as bridges between the front panel of a tower chassis and the mid-board headers that are attached to the motherboard's PCB. Plugging in tiny labeled cables into tiny unlabeled holes has long been the bane of many PC builders, so being able to simplify the process and make it more comfortable is always a welcome addition. 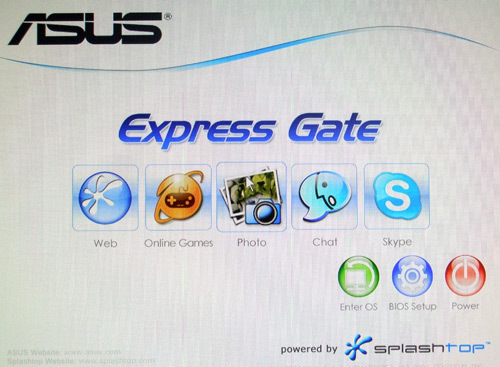 Asus Express Gate is a fast-loading, miniature operating system that's accessible as a prompt option after the system is booted. Unlike other incarnations of Express Gate that use a dedicated card to ensure access to the miniature OS, the ASUS P5Q-EM relies on having Express Gate software installed using an existing Windows installation mounted on a formatted hard drive. This isn't nearly as useful for troubleshooting purposes, since any hard-drive corruption that makes accessing Windows impossible will also make the Express Gate software inaccessible as well. The photo viewer does make use of one feature that isn't available on hardware-based Express Gate systems: this software variant also has support for USB devices. Unfortunately there's still not a whole lot that can be done with USB storage aside from opening .jpeg and .tiff files. If Asus' Express Gate operating system doesn't recognize a file extension, in most cases it simply can't be opened. Curiously, Express Gate can't access or modify a hard drive's contents, making it less than ideal for troubleshooting computer problems... sad, because that respect would make this software infinitely more practical to the average computer user faced with a corrupted Windows installation. While the idea of instant-on computing is certainly intriguing, its implementation here is a novelty than a practical and useful tool. If Asus could expand Express Gate's functionality with more diagnostic tools and the ability to mount hard drives for access and repair (as well as being able to install the Express Gate software from a simple command prompt onto a bootable USB device), this software would warrant serious attention. Pg 14. Intel X4500HD Graphics - Smooth HD Playback?